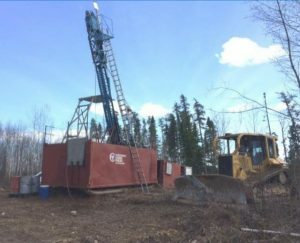 QUEBEC – Montreal’s Yorbeau Resources has resumed diamond drilling at its Scott copper-zinc property between the towns of Chibougamau and Chapais. The goal is to identify an extension of the deposit west of the Gwillim fault. A preliminary economic assessment was made in 2017 for the Scott project that planned on mining 12 million tonnes at grades of 4.14% zinc, 0.81% copper, 27 g/t silver and 0.24 g/t gold over 15 years. The PEA also suggested that the best potential for increasing resources lies west of the regional Gwillim Lake fault and at depth. Yorbeau geologists have recently reinterpreted the structure of the region, and they, too, think the most potential lies in that direction. The current program is planned in two phases totaling about 5,000 metres. The first phase will consist of shallow holes to investigate the actual displacement of the Gwillim fault. In the second phase, deep holes and wedge cuts will be drilled to explore the Scott horizon down plunge from the known resources. Resources at Scott were published in 2017 including both stringer and massive sulphide mineralization. The project has indicated resources of 3.6 million tonnes grading 0.95% copper, 4.17% zinc, 37.2 g/t silver, and 0.22 g/t gold. The inferred material is 14.3 million tonnes at 0.78% copper, 3.49% zinc, 22.3 g/t silver, and 0.22 g/t gold. Yorbeau has posted a presentation with details of the Scott project at www.YorbeauResources.com.